What a weekend, I'm exhausted, but it's a good exhausted. Saturday was a door buster day though that's for sure. More than 4,000 people joined forces at Federal Plaza in downtown Chicago to protest against the passage of Proposition 8 in California. My friends arrived at my house at 10:30 where we rallied the troops and started making Protest Signs. There were 6 of us at that point with plans to pick more up along the way. We made our way out to Sheridan Road to catch the 147 which took us to our destination. As we were turning the corner, we saw the bus waiting there and suddenly the adrenaline kicked in as I turned around to the rest of the group and yelled that the bus was waiting for us. As we lumbered on the bus, I immediately saw four of my friends - protest signs in hand. As we walked through the bus I saw more people that were on the way to the same place that we were. And finally when we found our seat at the back of the bus, I had a chance to meet some lovely lesbians. They had just found out about the rally from a friend who was calling everyone she knew to get more people involved. The energy on the bus was electric as it seemed at every stop we picked up more and more protesters. We arrived early at the rally and had a chance to walk through the growing group of people. We finally settled ourselves at the perfect spot - right behind the TV Cameras and had a great view of the speakers. It was powerful to walk through the crowd and see such a diverse group of people: young, old, black, white, gay, lesbian, straight, boyfriends, girlfriends - all true supporters that only want one thing - the right to marry the person they love! As I walked through the crowd it was inspiring to read all of the signs, slogans and posters that people had created. The one thing that struck me most were the "new" signs versus the old signs. There were plenty of signs that looked liked they had been through MANY MANY protests before, they were the grandparents that still stood the test of time with a message that still needs to be said. But there were more signs that were fresh and new, some were HUGE and required several people to hold them and there were small ones held by proud and happy individuals. There were simple signs with a few words and pictures and there were elaborate signs where people took time to really convey their message. Regardless of the message it was very powerful to be amongst this crowd of protesters. 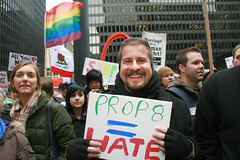 I had my sign (Prop 8 = HATE), my video camera AND my whistle, so I could help make some extra noise with the crowds. Since we were so close to the stage, it was difficult to really get a grasp of just how many people were crowded into the plaza. About 30 minutes into the rally there was an announcement that the City had blocked off Adams street to give us more room to collect, so that everyone could join around the common area and hear the speakers. Everytime that I looked behind me all I saw was a sea of faces, banners, posters and Rainbow Flags. At one point the guy standing beside me turned and handed me the flag that he was holding and simply said "Pass it along" So I held the flag for a few minutes letting the energy and power of the crowd absorb into me and warm me up. I then turned around to a girl that was standing behind me and I handed her the flag and said the same thing "Pass it along." We heard old messages and new messages, but the message was the same "Why can't we choose who we want to marry? Why can't we have the same rights that everyone elese has?" There was also an announcement of a future picket at Cinemark Theaters in Evanston as it was just announced that the owner of the Theater Chain donated $9,999 (just under the legal limit) to the Support of Prop 8. This coming Saturday at 5:00PM a group is planning on meeting at the theater to protest and let the theater goers know that the business they support, doesn't support the community - as I get more news it I will let you know. It was made clear that this was just the first of many to come down the road, and we ALL need your support! We were getting cold and hungry and had to break off from the crowd, to find food and comfort. As we We were walking out of a store and heard a lot of noise and shouting, it was the rally. They had organized even further and marched from Federal Plaza to Michigan Avenue and then north to the end of Mag Mile. I heard reports from friends that they marched for more than 2 hours and covered about 4 miles of streets. We joined the parade and eventually peeled off at Water Tower place where we stood in the median and shouted and blew my whistle in support of the marchers. The best part though was watching the faces of the stunned and surprised Mag Mile shoppers as they watched this huge influx of people marching past them shouting "What do we want? Equal Rights! When do we want them? NOW!!!" From all reports that I've heard, this was a peaceful rally, no one was hurt, no one was arrested - but more importantly, the message had been delivered! For more info: Check Join the Impact - Protest Prop 8 for more information, also check out Gay Liberation Network for updated information. As for me, every human being should have the right to marry whoever they love as long as it is for LOVE! I don't know why some other people think that marriage should be reserve for straight people only. Straight people ruins marriage a million times and I wonder if the conservatives ever think about the statistics. Marriage is made by love.. doesn't matter if you are straight or gay. I wonder when will they give equality to all human being! I am so proud of our community coming together and standing up for our civil rights. I marched in San Diego on 11-15-08 and it was one of the most moving experiences of my life. If you want to see some of the pics from San Diego I have posted them here.